A recurrent subtext of voyeurism runs through Trust: Photographs of Jim Marshall. The connotation isn’t seedy or even surreptitious, mind you, but rather it surfaces in how its subjects often seem oblivious to being so intently observed, let alone professionally photographed. 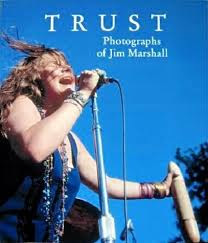 Edited by Dave Brolan, Trust renders an evocative and, at times, poignant look through the lens of renowned photographer Jim Marshall, who in his extensive (and still ongoing) career has documented some of music’s most iconic events (Monterey, Woodstock, Altamont) as well as its most influential artists. Marshall's own annotations accompany each photo, lending insight and endearing reminiscences. 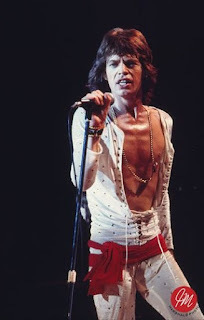 And while assorted portraits fill out the pages—The Who in ’68, up against a wall at their San Francisco motel; Hendrix in '67, perched at a drum kit during soundcheck at Monterey; Jagger in ’72, arms crossed and pouting in boyish defiance—the shots that capture artists in action or otherwise unaware are the ones that resonate most. Like a print journalist covering his beat, Marshall long ago took to embedding himself in the environment of his subjects so as to become inconspicuous among them. In so doing, he established a rapport that afforded him the opportunity to shoot when or wherever he wanted without pretense or undue distraction. Such is how he caught artists at their most candid and in their own element, like Miles Davis looking especially pensive at the Isle of Wight, Mahalia Jackson gloriously wailing away at Carnegie Hall, and the Beatles chatting with journalist Ralph Gleason before taking the stage at San Francisco’s Candlestick Park for what would turn out to be the band’s live farewell. “[T]o this day I don’t believe they knew it would be their last concert,” Marshall asserts. In Trust: Photographs of Jim Marshall are images of mortals living up to—or contending with—their own epic reputations, their own demons, and their own brilliant myths. It’s a fantastic collection from front to back.